20 April 2018, 12:12 p.m.
Public cloud data centers will account for a majority of this spending, 65.9 percent, growing at the fastest annual rate of 11.3 percent. Off-premises private cloud environments will represent 13 percent of cloud IT infrastructure spending, growing at 12 percent year over year. On-premises private clouds will account for 61.7 percent of spending on private cloud IT infrastructure and will grow 9.1 percent year-over-year in 2018. "Growing expansion of digital transformation initiatives enables further adoption of cloud-based solutions around the globe. This will result in a continuous shift in the profile of IT infrastructure buyers. SaaS, PaaS, and IaaS offerings address a broad range of business and IT needs of enterprises from 'lift-and-shift' to emerging workloads," said Natalya Yezhkova, research director at IDC. Worldwide spending on traditional, non-cloud, IT infrastructure is expected to decline by 2 percent in 2018 but nevertheless will account for the majority, 54.7 percent, of total end-user spending on IT infrastructure products -- that's down from 57.8 percent in 2017. This latest decline represents a faster share loss than in the previous three years. Moreover, the growing share of cloud environments in overall spending on IT infrastructure is common across all regions of the world. In cloud IT environments, spending in all technology segments, except for storage platforms, is forecast to grow at double digit rates in 2018. Ethernet switches and compute platforms will be the fastest growing at 20.9 percent and 12.4 percent, respectively, while spending on storage platforms will grow 6 percent. Investments in all three technologies will increase across all cloud deployment models – public cloud, private cloud off-premises, and private cloud on-premises. Long-term, IDC expects spending on off-premises cloud IT infrastructure will grow at a five-year compound annual growth rate (CAGR) of 10.8 percent, reaching $55.7 billion in 2022. 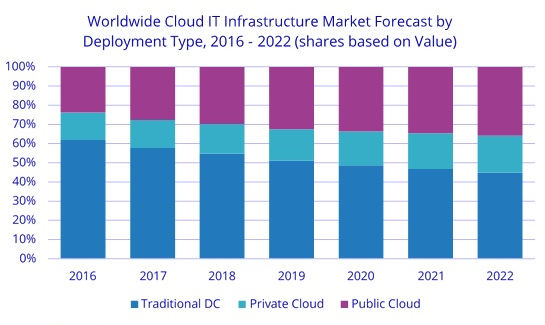 Public cloud datacenters will account for 83.6 percent of this amount growing at a 10.6 percent CAGR while spending on off-premises private cloud infrastructure will increase at a CAGR of 11.4 percent. Combined with on-premises private cloud, overall spending on cloud IT infrastructure will grow at an 10.9 percent CAGR and by 2022 will surpass spending on non-cloud IT infrastructure. Spending on on-premises private cloud IT infrastructure will grow at a 11.5 percenet CAGR, while spending on non-cloud IT (on-premises and off-premises combined) will decline at a 2.7 percent CAGR during the same period. Traditional IT vendors must act now to assure their survival in the evolving domain of hyperscale multi-cloud service offerings, and prepare for the predictable reduction in demand for legacy data center infrastructure. New momentum this year signifies the acceleration of a pivotal transformation in the shift to a hybrid multi-cloud era.